Pork beef mortadella: This food is low in carbohydrate, total dietary fiber and total sugars but Pork beef mortadella has total lipid, sodium and saturated fatty acid in high quantity. Pork olive loaf: This food has a low quantiti of total dietary fiber, total sugars and iron but has a high quantity of ash and sodium. Turkey pastrami: High in sodium and low in carbohydrate, total dietary fiber and calcium. Canned chicken liver pate: Canned chicken liver pate is high iron, selenium and riboflavin. On the other hand. is low in total dietary fiber, total sugars and calcium. Beef pork peppered loaf: High in ash, sodium and zinc and low in carbohydrate, total dietary fiber and manganese. Beef pork pepperoni: Beef pork pepperoni is high food energy, protein and total lipid. On the other hand. is low in carbohydrate, total dietary fiber and total sugars. Pork polish sausage: This food has a low quantiti of carbohydrate, total dietary fiber and total sugars but has a high quantity of total lipid, sodium and thiamin. Pork luxury loaf: High in sodium, zinc and thiamin and low in carbohydrate, total dietary fiber and total sugars. Pork mother's loaf: Pork mother's loaf is high total lipid, sodium and selenium. On the other hand. is low in total dietary fiber, total sugars and manganese. Beef and pork picnic loaf: This food is low in carbohydrate, total dietary fiber and total sugars but Beef and pork picnic loaf has sodium and selenium in high quantity. Raw fresh pork sausage: This food has a low quantiti of carbohydrate, total dietary fiber and total sugars but has a high quantity of total lipid, saturated fatty acid and monounsaturated fatty acids. Cooked fresh pork sausage: High in protein, total lipid and sodium and low in carbohydrate, total dietary fiber and total sugars. Cooked beef salami: High in total lipid, sodium and saturated fatty acid and low in carbohydrate, total dietary fiber and total sugars. Cooked turkey salami: This food is low in carbohydrate, total dietary fiber and total sugars but Cooked turkey salami has protein, sodium and selenium in high quantity. 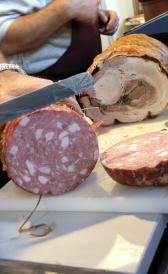 Pork dry or hard salami: This food has a low quantiti of carbohydrate, total dietary fiber and total sugars but has a high quantity of food energy, protein and total lipid. Beef pork sandwich spread: Beef pork sandwich spread is high sodium. On the other hand. is low in total dietary fiber, total sugars and calcium. Pork smoked link sausage: This food is low in carbohydrate, total dietary fiber and total sugars but Pork smoked link sausage has total lipid, sodium and saturated fatty acid in high quantity. Turkey breast meat: This food has a low quantiti of total lipid, carbohydrate and total dietary fiber but has a high quantity of sodium. 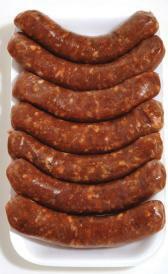 Beef honey roll sausage: High in sodium and zinc and low in carbohydrate, total dietary fiber and total sugars. Head Cheese Oscar Mayer: This food is low in carbohydrate, total dietary fiber and total sugars but Head Cheese Oscar Mayer has sodium in high quantity. 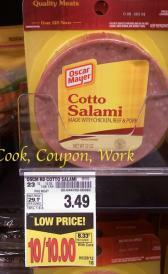 Salami (hard) Oscar Mayer: This food is low in carbohydrate, total dietary fiber and total sugars but Salami (hard) Oscar Mayer has protein, total lipid and ash in high quantity. Turkey Bacon Louis Rich: This food is low in carbohydrate, total dietary fiber and total sugars but Turkey Bacon Louis Rich has sodium in high quantity. Turkey Bologna Louis Rich: This food has a low quantiti of carbohydrate, total dietary fiber and total sugars but has a high quantity of sodium. Turkey Salami Louis Rich: This food is low in carbohydrate, total dietary fiber and total sugars but Turkey Salami Louis Rich has sodium in high quantity. Cooked veal bratwurst: This food is low in carbohydrate, total dietary fiber and total sugars but Cooked veal bratwurst has total lipid, niacin and saturated fatty acid in high quantity. Liverwurst spread: This food has a low quantiti of total sugars, calcium and manganese but has a high quantity of total lipid, iron and selenium. Roast beef spread: High in sodium and zinc and low in carbohydrate, total dietary fiber and total sugars. Bacon and beef sticks: Bacon and beef sticks is high food energy, protein and total lipid. On the other hand. is low in carbohydrate, total dietary fiber and total sugars. Cooked chicken bratwurst: This food has a low quantiti of carbohydrate, total dietary fiber and total sugars but has a high quantity of protein and niacin. Pork Italian salami: This food is low in carbohydrate, total dietary fiber and total sugars but Pork Italian salami has food energy, protein and total lipid in high quantity.